The European island archipelago of Malta in the Mediterranean Sea is attractive to both travelers and language learners alike and its rich culture, colonial history and pre-history and consistently pleasant climate ensure that you’ll never be short of something to see, do or explore here. Malta is host to some of the Mediterranean’s most attractive beaches and lagoons and the varied nature of these beauty spots allow you to spend a day on a touristy beach mixing with fellow holiday-makers and locals alike, followed by a day in a secluded bay enjoying some peace and quiet. The more popular, busier beaches offer a wide range of water sports so a day in the sun needn’t consist purely of lying on a sunbed enjoying a good book – although if this is your idea of a relaxing holiday, then Malta’s warm summer and relaxed atmosphere will appeal to you! The crystal-clear, turquoise waters which surround the island make it a perfect base for scuba diving and offer an opportunity to explore the island’s diverse marine life as well as underwater caves, reefs and wrecks. 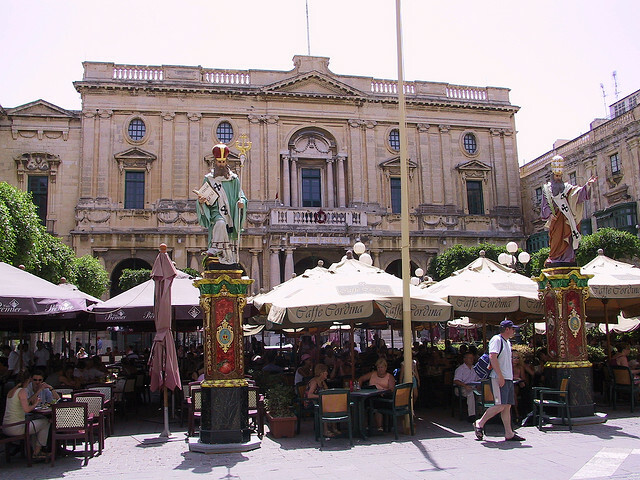 Inland, there is much evidence of Malta’s fascinating and varied history to be explored. A number of archaeological sites offer a glimpse into life on the island over 5000 years ago and much of Malta’s colonial past is still evident in the architecture, best seen on a lazy stroll through the island’s narrow streets. For travelers who want more from their trip than a sun tan and a cultural education, Malta is a great place to enroll on an English course. As a bilingual island there are numerous opportunities to practice your language skills outside of the classroom – a trip to one of the many village markets, for example, allows you to indulge in a spot of bargain-hunting as well as striking up a conversation with the locals. One of Malta’s restaurants which offer fabulous, fresh seafood or its several bars and nightclubs give you the chance to let your hair down and make new friends – all the while speaking English of course!